In this article we will see Spring Batch, a batch framework built on top of Spring framework. Before getting into Spring Batch, let us understand What is batch programming? A batch application is one which will perform set of jobs without manual intervention. Let us take typical shopping site where we will get product catalog feed as a flat file. We need to process the feed file and upload the data to shopping site product catalog database. In this case we can write set of tasks to read the feed file, transform the data and then upload it to database behind the scenes. Spring Batch framework provides necessary infrastructure to accomplish such kind of batch processing. Now, we will see the terminology used in Spring Batch framework. Job: A job is a process which will perform bunch of tasks. For example, Product Catalog processing is a job. This job has tasks like, basic product info import task, product specifications import task, price info import task etc.. Step: A step is an individual piece of task. For example, import price info as part of product catalog import job. Item: Item is an individual entity. For example, product is an item in the product catalog. Chunk: Bunch of items are nothing but a chunk. ItemProcessor: Processor transforms the data before writing it to the data source. The ItemProcessor is optional in the Spring Batch job configuration. ItemWriter: Writer writes the processed items to data source(eg: flat file, xml file, database etc…). 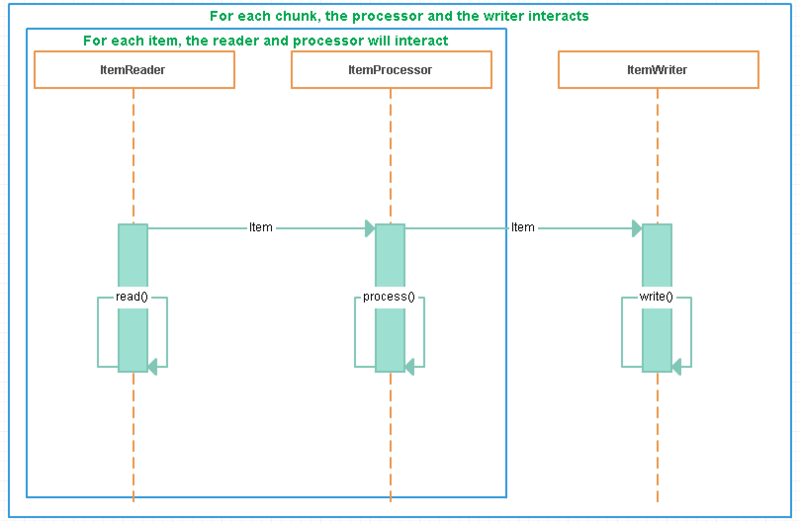 The below sequence diagram depicts the interaction of ItemReader, ItemProcessot and ItemWriter. The ItemReader, ItemProcessor and the ItemWriter interface implementations has to be provided to the Spring Batch job. The sample job configuration is given below. In the coming articles will see sample Spring Batch applications. Till then stay tune. Really appreciate your blog post.